Over the weekend of 1/2nd., July, 1950 thieves broke into Exeter Cathedral and stole a five foot high silver cross, weighing about one hundredweight, from its position on the high altar. The cross was encrusted with clusters of diamonds. The thieves had previously stolen a Rolls Royce in London, which they used to transport the cross before dumping it back in London. Forensic scientists were able to prove the car was used for transport. This showed the professionalism of the team, for what copper would stop a Rolls, to do a routine check!! The Diamonds were removed from the cross which was thrown over a hedge at Fenny Bridges, Honiton as the thieves drove back to London. This photo shows me and Eric “Nobby” Clark carrying the cross after its recovery. The diamonds and the thieves were never traced. The cross had been given to the Cathedral by the Lumley family (Joanna’s relatives) from Kenton, and now is displayed in Kenton Parish Church. Also of note, Eric Clark did several years as an instructor at Chantmarle, he was keenly interested in developing youth activities on Dartmoor. In the 50/60s, he founded “Operation Dartmoor”, and ran it until 1965. Eric transferred to Wiltshire and retired as Chief Superintendent at Salisbury. Jack Tarr is a retired police officer. He spoke to Peter Hinchliffe who edited his memories. 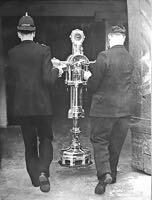 PC Eric Clarke (in uniform) and Detective Constable Jack Tarr carry the recaptured Cathedral Cross.